I know I’ve mentioned the importance of silence before, but now I’m going to dedicate a whole post to it! If you are someone in a care-giving role to young children, you know just how precious (and rare!) silence is! So, just as children learn to speak and read by being read to, they learn to sing and read music by being sung to. Just as researchers say to raise your child in a language-rich environment, you need a music-rich environment. Here is the caveat- that doesn’t mean bombarding your child with language or music constantly. Yale researchers have found that young mice exposed to more than 10 hours of continuous noise a day (something as low as a television in the background) developed fewer blood vessels in their maturing brains. This is most crucial for babies younger than two. Your child needs silence in order for their brain to make the leap from hearing music to thinking music. The human brain is a marvelous machine, and it takes things that we have experienced, and then begins to experiment with them. Anyone who has watched young children knows how creative they are naturally. They use things in ways we could never imagine as adults. Photo by Paul, licensed under creative commons. For them to be able to do this, they need silence. A time without direction, and without distraction. Some children will look quietly at books, some will build with the couch cushions and loudly re-enact their favorite story (with minor alterations! ), and some will sing their favorite songs, changing the words to fit their game, or even make up their own tune to fill in the silence of undirected play. Unfortunately for us adults, especially those that covet calm and quiet, this rarely results in actual silence! So shut off the radio, stop reading aloud books, Mom or Dad, and encourage quiet play. Shut down the distractions so that your child’s mind can grow and their creativity can flourish. You will all find some peace, but if your children are very young, probably very little quiet! In this Huffington Post article, the author cites research on how we praise our children and the effect it has on our children. The researcher Carol Dweck, has been working on this research since the 1960s, and this information probably isn’t new to you, but here is what we know: when you praise children for being smart, they attribute their skills to innate ability, but when you praise them for their hard work, they attribute skills to perseverance and practice. Children who do the latter are more likely to keep trying a task until they get it right and can accomplish more throughout their lives because of their mindset. Challenge your music student- let them experience failure- and then praise them for their work and diligence, not their skill or accomplishment. This way you will grow a musician. How old do you have to be to compose music? 18? 12? 5? Younger? 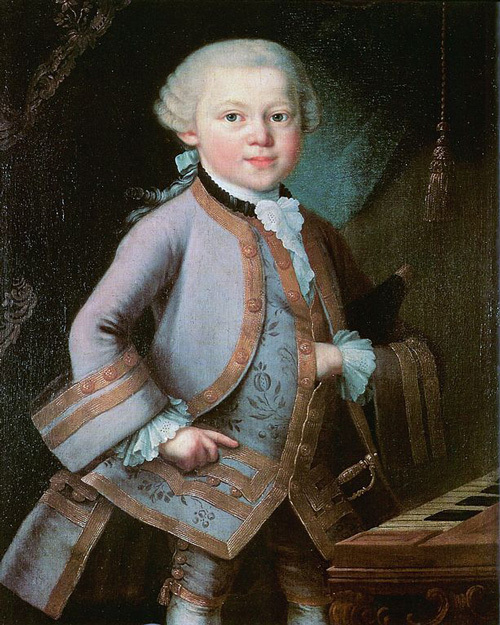 Mozart was only five years old when he wrote these first compositions. My son isn’t yet five and he writes compositions, too… but he’s no musical prodigy. He is not as proficient in music playing or writing as Mozart was. He can’t yet articulate his musical thoughts on paper, but he can improvise musically with words, rhythm, and melody. Everyone who has been around music and is allowed to experiment with music has the ability to do this. With proper encouragement, every child can improvise. So, how did we get to this point? SING. All the time. Play instruments or just play rhythms by clapping or patting or beat-boxing. What you will find is that your child will start repeating the things you do at different times. Let them experiment, even if it is annoying. Sometimes they will sing loudly or sing the same word over and over. Try to put up with it. You can try to redirect their efforts or ask them to try it more softly, but don’t tell them to stop! Start by giving them ideas to riff on- start a silly song about what you are doing and give them a turn to improvise. They will probably start by changing the words to a tune they already know, which is ok. Provide an accompaniment for them or have them provide an accompaniment for you. Beat-boxing is a fun way to do this. This shows them you can improvise something without words and is an easy way to practice ensemble singing/playing. Let them play at conductor and tell you what the song or piece should sound like. Have them try to describe it to you as best as they can and try to make their composition come to life. As they get older, start introducing technology to record themselves. They will spend so much time playing back their songs, and with programs like the iOS’s Garageband, they can add drums or other instruments to their recordings and have fun making it sound new and different. The most important thing is to find time to make music together and have music-making be fun and feel judgement-free. Perfecting a composition or figuring out how to express verbally or visually what you hear in your head can be frustrating. Make them feel safe and not on-the-spot when composing and improvising. Allow them to see you make mistakes and laugh it off. Music-making at home doesn’t need to be perfect to be enjoyable. How do you improvise or compose with your family? The Lessons of Failure: Sometimes you win, Sometimes you lose. There’s of course truth and a lesson in this song by the Shins from Yo Gabba Gabba. But it’s okay, you try again… Do your best so you hold your head up high. Like all worthy pursuits, especially those where the word “practice” comes into play, failure is a part of the journey. Practicing music can be full of small and large failures; the failure to execute a particular phrase in the music, or getting flustered and forgetting your solo in the middle of a recital. Small and large, failure brings with it many lessons, and those lessons benefit us in all facets of life. For those who are amateur musicians, learning those lessons while having fun with music can soften the blow, while for professionals it can come with many more ramifications, like losing a chance for career advancement or the ability to support yourself. Let us concern ourselves with the amateurs, ourselves and our students or children in this scenario. What are they learning about failure? What should they be learning? It’s ok to fail. I’m putting this first, because I think it is the most important. Everyone fails at something some time. If you don’t, it’s either because you are one of those one in a billion people who are geniuses who are good at everything, or, more likely, you never try anything you think you may fail. In my students, and even my own children, I see us becoming a culture that is failure-adverse and it is stifling creativity and possibility. No one who has ever created anything good or beautiful got it right the first time. Authors have editors, inventors have multiple iterations of the same device, and computer programmers issue patches for their programs. If your students can sight read everything you put in front of her, you are not challenging her. You are holding her back; holding her back from failure, but also holding her back from success. Failure teaches humility. It’s good to be reminded that we are not perfect and that other people may be better at something than we are. It shows us what we should work on or what we could accomplish with more work. It sometimes shows us that we may have chosen the wrong path. Humility is not shame. Failure that comes despite hard work should make us proud, but ground us in reality. Maybe I choked in my piano recital and played horribly, despite the hours of practice I put in. I should be proud of my practice, but there is a lesson I have to learn- maybe I didn’t practice enough to feel confident in my playing, or maybe I need to practice being confident (the latter is much more difficult!). No matter what, especially if I am comparing my performance with someone else’s, I should come away humbled by their success, but not jealous of it. Practicing failure teaches grace. Just using the word grace seems antiquated, but it is a quality that is rarely focused on, but when you meet someone who has it, it is inspiring. By grace, I mean the ability to act in a controlled, polite, and smooth way, without awkwardness. A good musician never gives away their mistakes; don’t make a wrong note worse by adding a grimace or a shake of the head. THAT takes control. Control of the body and control of the mind. When you don’t pass the audition, you don’t pout, or complain- you learn and move on. Sometimes we have to grieve our failures, but we have to learn to do so in way that is mature and appropriate. Children have trouble with this, and we understand that, and try to comfort and calm them, and teach them skills to control and focus their reactions. When this skill has not been learned in adulthood, we get inappropriate comments on Twitter that shame the author, or millionaire rap moguls embarrassing themselves on national award shows. Failure teaches determination. How many people are admired for their stick-to-it-iveness? You can’t have that trait if you don’t often fail. Failing often is a good teacher. It helps us grow, it helps us get things done. Your child is learning that at the piano right now while she is practicing that same measure over and over and continually missing the last note. Then- ah ha! She gets it! And misses a different note in the process. No matter, she is learning to stick with it until it is right. That’s a good quality to have in an employee, but an even better one in an employer. She is willing to put in the work to make herself better, which is what it takes to be successful. It’s a small lesson now, but it will pay off as the stakes are higher and she is willing to put in the work and try again and again for what she wants. Failure teaches problem-solving. Every time a music student fails to play her piece correctly, she has to figure out what went wrong and how to fix it. Music teachers teach many different methods to practice to refine pieces in as little time as possible. Teachers teach and students learn how to prioritize musical goals, and that is a skill that translate into prioritizing other assignments at school or work. Failure teaches what success means. The better we know failure, the more we are able to recognize success in its many forms. That means, small successes, not just ones that are accompanied by awards and people telling us “good job!” There’s a satisfying feeling to perfecting the piece you are working on, even if you never play it for the audience and hear their applause. The perfection is not the gratifying part, it’s the accomplishment of overcoming the struggles that challenged us. As parents and teachers, it is important for us to put failure into perspective for children. No one likes losing or not being able to do something that they are striving for, but it’s a part of living and learning. Children should be given opportunities to fail and succeed; they should be sheltered from neither. They need developmentally appropriate challenges so that they can grow into adults who are not afraid to reach and fail in order to succeed. How do you talk about failure with your children? Girls Hand Clapping. Licensed under Creative Commons. Yesterday I posted about how making music together was great for social learning. Music is inherently social, but there are ways to make the music itself social! So, here’s the challenge: have an exclusively musical dialogue with your little music-makers! Just a warning: some children will rebel against this idea, so it may take many attempts to get them used to the idea of conversing with you musically. Find the way they are most comfortable expressing themselves musically. For one child that may be through movement and dance, another with instruments, another with chanting, and yet another with singing. Keep at it until you find what works. This is a great exercise in working around individual differences, a skill that is useful for all those early childhood battles, like potty training. You can use this rhyme from the James T. Callow Folklore Archive, which has been modified for this purpose. After the introduction rhythm, you can make up a chant, a rhyme, or melody and then the child can respond. Often, children will mimic exactly what you do, which is ok. Encourage them to make up something different. You’ll find as they grow older they have more musical ideas to choose from. In my experience, sometimes children will refuse to respond “musically” -probably out of discomfort or embarrassment- but I have yet to see a child (or adult!) give a musical response that was inappropriate. For instance, in the audio examples above, I’ll chant the rhyme in its original duple (think “in two,” like a march) meter, then in triple (think “in three,” like a waltz). Once the meter is established, a child with enough musical experience in duple or triple will tend to stick with the meter provided. Their response may be longer or shorter than yours, and that’s ok, too. You can be creative and change the words to suit musical movement instead of dialogue, with “every night they hang their clothes and this is what they do.” Instrumental improvisation, with “have a jam,” or even silly improvisation with “my doggy, your doggy…” You could go so far as to try to sing it in different tonalities, also. The possibilities are endless. Let me know how your musical dialogue goes and how you found how your little ones were most comfortable improvising! *I first came across this rhyme used to start improvisation at a workshop given by Wendy Valerio, so credit goes to her for the original idea! It’s just too good not to share! 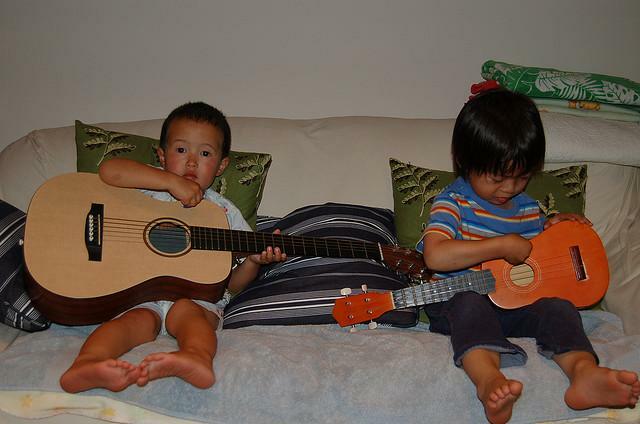 Kids playing guitar. Licensed through creative commons. Music is not an individual endeavor. As parents, so much of what we teach is didactic; “no, don’t do that,” “let me show you how to tie your shoe.” However, most musical learning, especially at an early age is informal and interactive. Even babies less than one year old can start to participate, meaning that you’re not making music to them, bur with them. Their clapping off the beat and making gurgling sounds is their attempt to make music with you. Humans are social creatures, and by our nature we want to socialize and feel included in a group. Making music is one way that we do that. When you make music at home, try to make it as social as possible. That means letting everyone be able to give their input, as though you were having a conversation. Get down on the floor with your children, and let them pick an instrument for you, or pick the song that you are going to sing. Maybe they’ll make up new words to the song, or sing it the “wrong way.” Follow their lead, and give suggestions, too, but make it “our music.” Just like in social situations, you might need to mediate “musical fights,” which could be agreeing on a tempo, a volume, the songs, or instrument choice. Make sure that your children get a chance to see how musicians play in groups. Informal concerts, like those at coffee shops or bandstands are a good chance for them to see musicians interacting with the audience. You may be able to take them to an open rehearsal, which will let them see how much work goes into playing, how the musicians have to get along, and you don’t have to worry about your child’s behavior as much as at a concert, or your ability to stay through the who show. 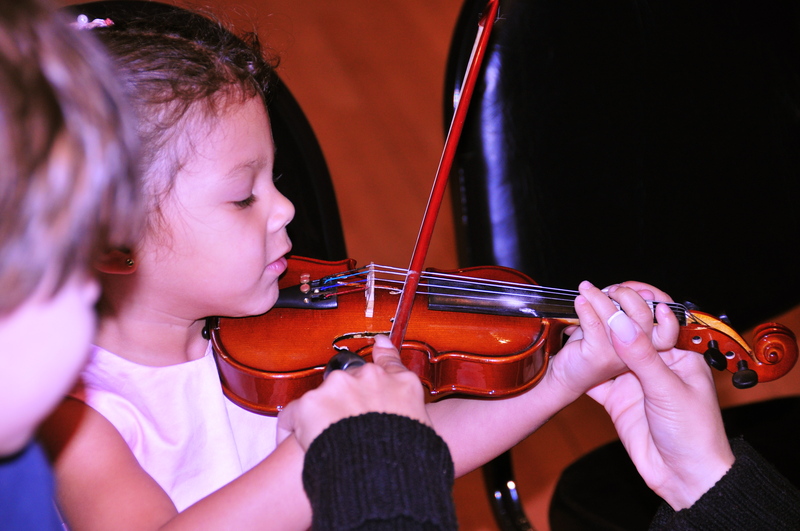 Music classes are a great way, even for the youngest children, to experience group music making. Making music in group is beneficial for musical learning, but also social learning. All students, even students with learning disabilities or autism, benefit from the social interaction in a musical environment. Music brings people together and gives us a way to navigate and come to accept individual differences, making us better classmates, siblings, or friends. As a teacher, I’ve seen shy children come out of their shells through music, I’ve seen children who struggled in every other subject find the joy of excelling in music. You can do this for your family, too. Families are made up of people with a wide variety of ages and abilities, but who can come together in music. Everyone in the family can do something musical. Maybe the infants only listen and smile while the toddlers dance and the preschoolers sing, while mom or dad plays an instrument and sings. Try to carve out a time where you can make music together as a family. If big sister is practicing a well-known piano piece, let her little brother sing along and make an impromptu duet. Don’t let me delude you into thinking that all music-making will be happy and conflict free. There will be times when it will be difficult to get everyone together or for everyone to find their role. Working through these issues and focusing on the bigger picture of coming together to make music is what makes the experience so useful. Those problem-solving skills in a social environment help children become better friends and helpers. So, find time to make music together and have a musical conversation. The next post will focus on how to dialog through music in a kid (and parent!) friendly way!